The Harry P. Leu Gardens in Orlando is a 58 acre wonderland of tropical, lush, formal gardens surrounding the Leu House Museum. These gardens cover themes from ideas on how to create your perfect home garden, vegetable garden, and butterfly gardens, to the largest formal rose garden in Florida. This place will amaze and delight you and your children. It was really fun to see Bryan's amazed look as he stood beneath an elephant ear plant with leaves as big as a car! We spent a good amount of time in the rose garden, wandering through the trails and fountains, and then watching as a storm rolled in, changing the landscape and bringing some much needed cooler temperatures, and rain. The flowers looked so pretty with the raindrops on them! The paths are well paved, and easy to navigate. There were whimsical metal sculptures in the idea garden that were fun to see. These gardens are popular for events, and weddings, and they also have special events, like Date Night in the Gardens, where you can enjoy a movie on the largest screen in Central Florida, in a wonderful garden setting. They also have storytelling events for children, and Folk Music Festivals brought to you by Central Florida Folk (www.cffolk.org). 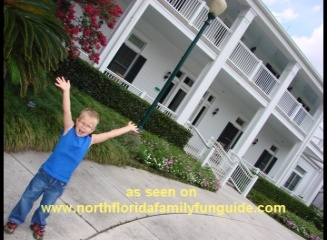 They have a Museum on site, the Leu House, which is a home that has been meticulously refurbished to demonstrate the turn-of the 20th-century Florida Living. This museum is closed in July for annual maintenance. They have a Fourth Grade Education Program available at the Leu House Museum, which is a field trip designed to teach children the history of life in Central Florida during 4 different time eras representing the 4 different owners of the home. They have hands on activities, demonstrations and storytelling by authentically costumed interpreters. Cool! I highly recommend this wholesome garden adventure for you and your family!